- April 2 - 8, Bangkok: Guru Gajendra Panda, Sudipta Panda, Madhusmita Pattnaik, D.Priyanka and Mokshada Tripathy present DEVI DASAVIDHAMI for BHARAT SANSKRUTI YATRA. Sponsored by High Commissioner of India, Thailand Ministry of Culture Govt. of India, and Hams, Kolkata. - April 9 - 12, Bahrain: Guru Gajendra Panda, Sudipta Panda, Madhusmita Pattnaik, D.Priyanka and Mokshada Tripathy perform KRISHNAYA TUVYAM NAMAH for ODISHA DAY celebration, 6pm. Sponsored by Ministry of Culture, Govt. of India under National Presence Scheme. - April 12, New Delhi: Guru DGajendra Panda and Kaori Naka (Japan) present HARA-GOURI ASTAKAM for GURU PARANAM UTSHAV organized by Vaishali Kala Kendra Noida. Sponsored by Ministry of Culture, Govt. of India. 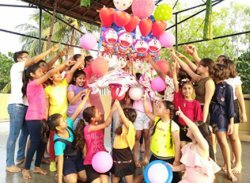 - April 15, Bhubaneswar: Guru Gajendra Panda and dancers of Tridhara present SAKHI GOPINATHA for inaugural day of CAPITAL DAY FOUNDATION, organized by C.D.C.C. 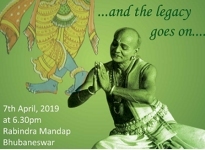 - April 22 - 28: Paris, Belgium, Netherlands, Switzerland: Guru Gajendra Panda and dancers of Tridhara present Odissi dance drama SRI GANESH for BHARAT SANSKRUTIK MAHOTSAV, organized by Hams. -14th April, Singapore: Ileana Citaristi gives a lec-dem on Odissi titled ‘Shades of love in Odissi dance’ at 11 Upperwilkie Road, organized by Chowk Production, 11am. And a lec-dem on Mayurbhanji Chhau dance at Stamford Art Centre, 4.30pm organised by Shanta Rati Initiative. Sudarshan Chakravorty’s schedule for his USA tour. - April 9: Sudarshan Chakravorty leads a Showcase & Sharing with students of San Francisco based choreographer Mary Carbonara and also discusses the collaborative production FROZEN ANGELS which Mary choreographed for Sapphire in March 2017 as part of INCRES (International Choreographer Residency in Sapphire). 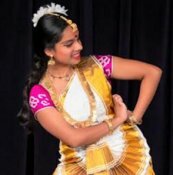 - April 11 -13: Sudarshan Chakravorty leads a Community Workshop for Bangaliyana, a Bengali Community based organization in Fremont to promote Indian dances. - April 14: Celebrating Bengali New Year with dance, music, food, and conversations sharing moments of productions and experience in working with the diaspora in USA. Presented by Bookmyshow, the 16th century love saga MUGHAL-E-AZAM is all set for its grand comeback to the capital city, once more. Directed by film-maker and playwright Feroz Abbas Khan with performances by an enviable cast, beautifully choreographed Kathak sequences (choreography by Mayuri Upadhya), mesmerizing music and intricate sets, Mughal-e-Azam captures the chronicles of Salim and Anarkali’s classic love story like never before. The classic screen-to-stage adaptation also boasts of dazzling costumes by designer Manish Malhotra combined with the technical expertise of Broadway and original hit songs. The grand musical will be back for its 175th show and will be staged at the Jawaharlal Nehru Indoor Stadium, New Delhi. Schedule for Kathak exponent Sharmila Sharma. - April 28: Theatre du Passage, Neuchâtel, Switzerland: Yatra: A friendship story between a Gypsy girl and a temple dancer. Featuring Sharmila Sharma & Annjali Shah (dance), Shashin Garach, Olivier Nicola (comedian and storyteller), Amandine Baldi (lights), Anuvi Desai (costume). Schedule for Natya Tarangini and The Reddys. -6th April: Yamini Reddy & Bhavana Reddy along with Natya Tarangini disciples (Ananya Khosla, Naureen Mehra, Mahesh, Avika Bassi, Divyangna Ahuja, Sneha Chella) perform for Ugadi Celebrations for Vice President of India. -19th April morning: Dr Raja Reddy & Dr. Radha Reddy receive ‘Hanumant Award 2019’ for nritya at the Hanuman Jayanti Mahotsav, Bhavnagar, from Morari Bapu. The Kalavedi Puraskara will be presented to Bangalore's senior Guru Vasanthalakshmi. At: MES College, 6.15pm. All are welcome. 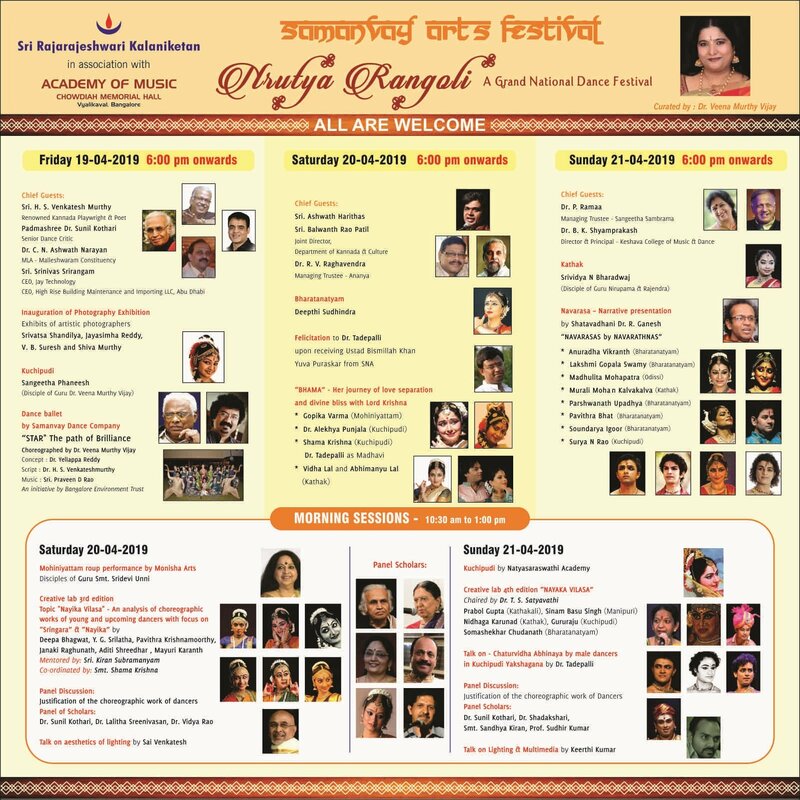 Sri Rajarajeshwari Kalaniketan in association with Academy of Music presents Samanvay Arts Festival NRUTYA RANGOLI, curated by Veena Murthy Vijay. At: Chowdiah Memorial Hall. All are welcome. 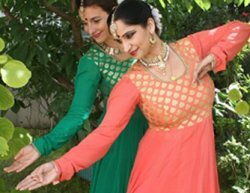 NYKF presents NEW YORK KATHAK FESTIVAL. Featuring guests of honor Pandit Birju Maharaj, Saswati Sen, as well as performances by Prashant Shah, Pandit Satya Narayana Charka, Janaki Patrik and the Kathak Ensemble, Anjali Nath, Courtyard Dancers, Farah Yasmeen Shaikh and Noorani Dance, Barkha Patel, Labonee Mohanta and many more. 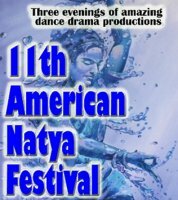 Soorya Performing Arts presents 11th edition of AMERICAN NATYA FESTIVAL. For Ramachar Memorial Concerts edition four, Dr.Anupama Kylash presents THE SENSUAL AND THE SUBLIME in the Telugu Padam. The presentation explores various phases and facets of Telugu Pada literature through rare songs of primary composers like Annamayya, Sarangapani, Kshetrayya, Munipalle Subramania Kavi and Pothuloori Veerabrahman. Nrityayatri in association with Purnima and Dinesh Raste present a Kuchipudi recital by Deepika Reddy for the first time in Pune. At: Symbiosis Institute auditorium, Bhosle Nagar, Range Hills, 5.30pm. All are welcome. At: Tagore Theatre, Chandigarh, 4pm. All are welcome. Rhythmosaic School and Dance Institute is presenting a contemporary dance series SUBLIME featuring choreography by Prasanna Saikia and presented by Rhythmosaic Repertory. 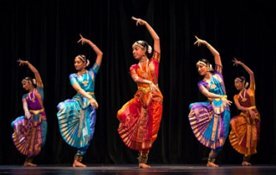 Natya Dance Theatre and the Chicago Kali Bari Temple present ‘Music for Peace,’ a unique musical performance with dramatic English commentary honoring the lives of Mahatma Gandhi and DK Pattamal. Presented by JustUs Repertory with script by Gowri Ramnarayan. At: Chicago Kali Bari Temple, 2S511 IL Route 53, Glen Ellyn, IL 60137, 4pm to 6pm. All are welcome. Jiva Dance presents THE FOUR HORSEMEN as a part of the 11th Natya Festival. 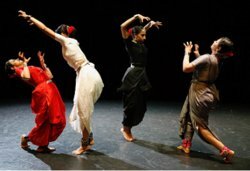 NCPA’s Mudra dance festival celebrates oneness. The feeling of being interconnected to everything around. This oneness translates into many deep connections that exist between the different forms of the Arts, among the different styles of dances and also between the body, mind and soul of a dancer. In the world of communication, hasya is the magic key and the festival celebrates this rasa with a series of performances by acclaimed artistes. *Multi dance style presentation by Kanak Rele & group - Kanak Rele, will explore the various degrees of hasya through different characters. Rama, who is a pious figure, will smile with a little bit of teeth but always with restraint. Sita, on the other hand, might smile in a coy fashion towards her husband or when expressing her desire upon seeing the golden deer. Shurpanakha, the sister of Ravana, will essay a demonic kind of laughter. While they all have hasya in common, they are all different in their own ways. *Bharatanatyam by V.P. Dhananjayan & Shanta Dhananjayan - A scene from Ramayana (Tulsidas - Hindi), Ravana's sister Soorpanakha encounters with Sri Rama and Lakshmana in the forest. The brothers make fun of the demoness whose amorous approach evokes laughter. The demoness gets her nose cut and ran into the woods. *Mohiniattam by Mandakini Trivedi - Verses from Adi Shankara’s Amarushataka and Vidyakara’s Subhashita Ratna Kosha. The former is a secular love lyric, while the latter is a humorous look at the gods. 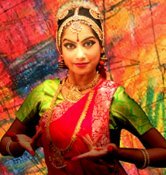 *Bharatanatyam by Priyadarsini Govind - The main piece is strung together portraying humour in different regional languages. *Kathakali by Sadanam Balakrishnan - Ravana did rigorous penance to Lord Brahma for thousands of years and obtained boons to conquer the three worlds. He is invincible and only mere human being can defeat him. Proud Ravana approaches his brothers to know what boons they have obtained. Kumbhakarna who wishes to get the boon to destroy all Devas by slip of tongue instead of nirdevathvam asked for nidravathvam (to sleep always) and he got that. His youngest brother Vibheeshana want to become an ardent devotee of Vishnu and he got that. This reply made Ravana laugh at them. Here the hasya can have all the six variations, from Smita the gentle smile to Hasita, Vikasita, Avahasita, Atihasita and Apahasita, which gradually increases to its uncontrolled climax. SUNAINA presents in association with India Habitat Centre, HER STORIES, conceptualized and choreographed by Guru Kanaka Sudhakar & Aparajita Sarma. An innovative Bharatanatyam performance depicting stories of a lovelorn nayika, dilemma of Kaikeyi and today's empowered woman. At: Stein auditorium, 7pm. Entry free. Bharatakalanjali presents a Bharatanatyam recital by Lakshanya Vasan from Melbourne. At: Music Academy mini hall, 6pm. ABHAI celebrates its 31st Annual Day at Narada Gana Sabha main hall, at 10.30am. 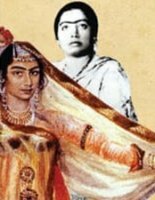 TEHZEEB-E-TAWAIF is a day-long symposium on courtesan culture and women performers in India from 18th to 20th century. Presented by Sufi Kathak Foundation, Royal Opera House of Mumbai and Avid Learning. 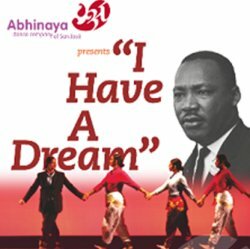 Abhinaya Dance Company restages STORIES OF JUSTICE which examined the non-violent resistance strategies of Martin Luther King, Jr and the story of Rosa Parks. Natya Vriksha’s 15th edition of WORLD DANCE DAY celebrations is curated by dancer Geeta Chandran. With workshops, lectures, biographies and performances by young dancers, the two-day program offers invaluable fare for both the dance community and to all those others interested in the arts. The World Music Institute presented DANCING THE GODS, co-curated with Rajika Puri. Sas3's Dancing Feet in association with Face of Artz and Natya Swara celebrates the diversity of dance on world dance day with different forms of Indian, continental and contemporary dance including Bharatanatyam, Odissi, Kathak, Mohiniattam, Kuchipudi, Vilasini Natyam, Rabindra Nritya, Gaudia Nritya, Tutting, Oriental Dance, Belly dancing, Butoh, hip hop, bachata and contemporary. Kalasagara UK presents TURN ON LIGHTS BEFORE YOU LEAVE, an evening of Bharatanatyam by the students of Usha Raghavan, Director, Kalasagara UK, in celebration of Mother’s Day and to raise funds for 'Gift of sight' program of the charity Navajeevan Blind Relief Centre, Tiruchanur, India (www.navajeevan.org). Mothers & their daughters along with some senior students perform. 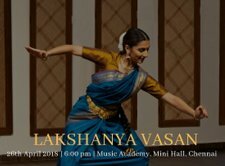 Yuva Bharati presents SAMYU - A UNION by Nitya Narasimhan & Kassiyet Adilkhankyzy followed by solo Bharatanaytam performances by Tejaswini Narayanan, Yamini Kalluri & Aishwarya Venkat. At: Stein Auditorium, 7pm. All are welcome. 2.00 BVVSN Raju, Sri Satya Kuchipudi Kalanilayam, Chintal, Hyderabad. Utsav Educational & Cultural Society-Ranjana’s Odissi Dance Academy presents SU-TARANG, 2019: A Celebration of Odissi Dance, dedicated to World Dance Day, by the disciples of Guru Ranjana Gauhar.